Lots of fake rumors spreading in social media regards Anna University 4th November 2017 exams. So, Anna University announced official notification regards Anna University 04/11/2017 Exams. 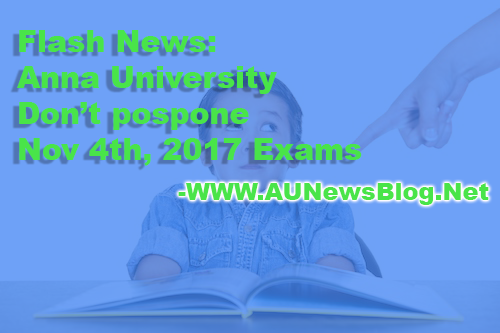 Anna University doesn't postpone tomorrow (04-11-2017) exams. So, Students don't believe rumors and prepare well for your exams. Source: This was an official notification published by Anna University in Media. If any new update comes, We will post it here.